The Osborne U-Cut No. 410 is a fast and flexible tool for horizontal straight or wedge cutting of polyurethane foam foams. Provides a straight consistent cut on foam sheets. The U-Cut is great for proto-typing and small furniture jobs. The desired cutting thickness is quickly obtained by means of an adjustable screw setting. 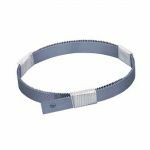 The U-Cut will cut from a minimum thickness of 6mm to a maximum thickness of 230mm. Material up to 910mm in width and unlimited length can be processed. Scrap can be glued, salvage and re-cut. Place U-Cut on a flat surface with the slab of material to be cut. The operator then merely pushes and pulls the U-Cut in a saw-like action making wedges, curves, arcs and other special shapes. Best results are obtained by working on a smooth surface. Hold the material in place with a piece of plywood, either by hand or with a weight. Supply enough pressure to prevent the foam from moving, but not enought to compress it so it will expand again after cutting. If a sheet of plywood is not used, the cut is unlikely to be uneven. When starting the cut it will be easier to angle into one corner first, rather than trying to start the sut across the whole face.